"At the present moment, in our conditional state, we are jīva-bhūta. And when we become actually situated in our spiritual platform, that is called brahma-bhūtaḥ. Brahma-bhūtaḥ prasannātmā na śocati na kāṅkṣati (BG 18.54). So everything, there is link. So bhakti-yoga means detachment and knowledge. Somebody thinks like that, foolishly, that 'Bhaktas are generally fools and rascals, and therefore they take to bhakti-yoga.' But actually that is not bhakti-yoga. 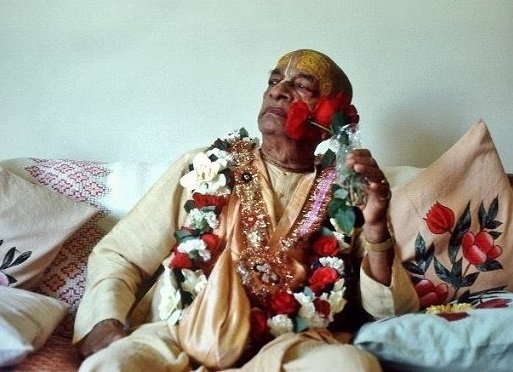 One who has taken to bhakti-yoga, he cannot be fools and rascals. He must be very learned. Svayam eva sphuraty adaḥ. How he becomes learned? Now, svayam eva sphuraty adaḥ. Everything becomes revealed. Kṛṣṇa reveals. Nāśayāmy ātmā, ātma-bhāvastho jñāna-dīpena bhāsvatā. If one is pure devotee, then Kṛṣṇa, from within, He will give knowledge. The Kṛṣṇa... Just like Kṛṣṇa is giving knowledge to Arjuna. He's a gṛhastha. He's a soldier. He's not even a brāhmaṇa. But who can be greater man of knowledge than Arjuna? Because he's directly receiving from Kṛṣṇa. And who can be greater teacher than Kṛṣṇa? So Kṛṣṇa says that 'If you are engaged twenty-four hours in devotional service,' then, Kṛṣṇa says, 'from within,' He will give all knowledge. Therefore vāsudeve bhagavati bhakti-yogaḥ prayojitaḥ (SB 1.2.7). If you actually engage in the devotional service of Vāsudeva, then jñāna and vairāgya automatically becomes revealed unto you. There is no endeavor."